Version 0.6.6 is turning into one of the worst versions of y-cruncher. Once again, I've found some serious bugs that need to be fixed asap. Because of the severity of the regressions that have been fixed, I highly recommend everyone who uses swap mode to upgrade to this patch (v0.6.6.9452). In particular, the error-detection in v0.6.6 prior to this patch is so badly broken that it's as good as useless. There's an on-going task to refactor the entire program from C -> idiomatic(ish) C++11 for better long-term maintainability. In v0.6.6, this refactor touched some of the fragile swap mode code - which is very difficult to test because it is slow, resource-intensive, and full of corner cases. This release is a bit premature since it hasn't been tested much yet. But it fixes a lot of bugs including one that causes all large Pi benchmarks to fail on the 6-core Haswell processors. So ready or not, it needs to be released. In addition to bug-fixes, v0.6.6 adds a couple of new features and some minor optimizations. I'm please to announce that "houkouonchi" (who wishes to remain anonymous) has set a new world record for the digits of Pi with 13,300,000,000,000 digits. Verification using the BBP formula was done by myself and took 182 hours on a Core i7 920 @ 3.5 GHz. 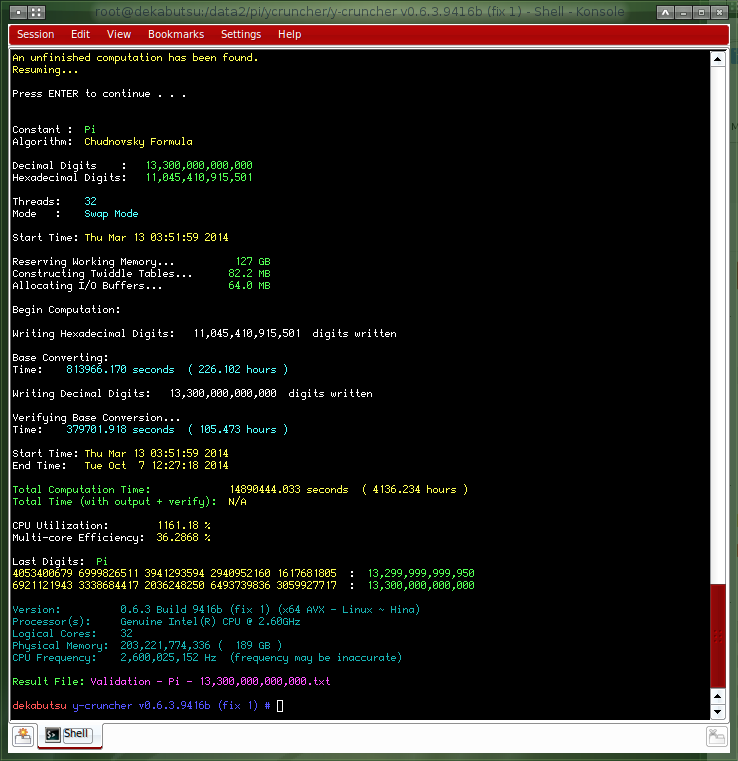 Overall, this computation was slower than Shigeru Kondo's 12.1 trillion because the machine had less disk bandwidth and was not dedicated to the task. *In order to view and/or decompress the digits, you will need the Digit Viewer. It comes bundled with y-cruncher. It took way too long, but support for AVX2 has been added. The new binary targets Haswell processors and requires AVX2, FMA3, and BMI2 instructions. Theoretically, it should also be able to run on AMD Excavator processors. As a word of warning: On Haswell, the AVX2 binary runs considerably hotter than with just AVX. So please take care when running it (with or without overclock). This is especially the case with all the thermal problems that Haswell has. Oh hey look at the date! The long promised (and overdue) version for AMD processors is finally done. The "x64 XOP ~ Miyu" binary is optimized for AMD processors and uses FMA4 and XOP instructions. It will not run on Intel processors. AVX2 is next on the list. But progress has been severely hindered by numerous issues with the Visual Studio compiler. VS2012 has severe bugs in its AVX2 code generation. VS2013 has a 10 - 30% performance regression in AVX code generation. Both versions generate terrible FMA3 code. While doing some performance tuning on the XOP binary for v0.6.4, I discovered a nasty bug. The bug was introduced in v0.6.3 and also affects the SSE3 binary. So a patch has been released along with a couple other minor bugs that were discovered after v0.6.3 was released.